If you’re like me, you love this time of year – Summer has released its super hot hold, Winter is yet to bite, and the weather is great for outdoor walks, some pre-Winter gardening, and the first seasonal soups. This time of year is also when we should look to our skincare routine, and see if we need to swap out some of our lighter Summer products for more hydrating products as the air becomes cooler and dryer and our skin needs extra hydration. For those who prefer a simple skincare routine, Skin Doctors Daily Essentials Trio could be just what you’re looking for! The Cleanser, Day Cream, and Night Cream will have you well on your way to hydrated skin ahead of Winter. Skin Doctors pH Balancing Cleanser removes all traces of makeup, dirt, oil and dead skin cells by gentle AHA exfoliation. Formulated with avocado extract to nourish and moisturise, lactic acid to exfoliate, and sodium laureth sulphate and cocamidopropyl betaine to cleanse without stripping the natural oils and maintaining the pH integrity of the skin, your skin is left feeling soft and smooth. 100ml RRP $24.95. 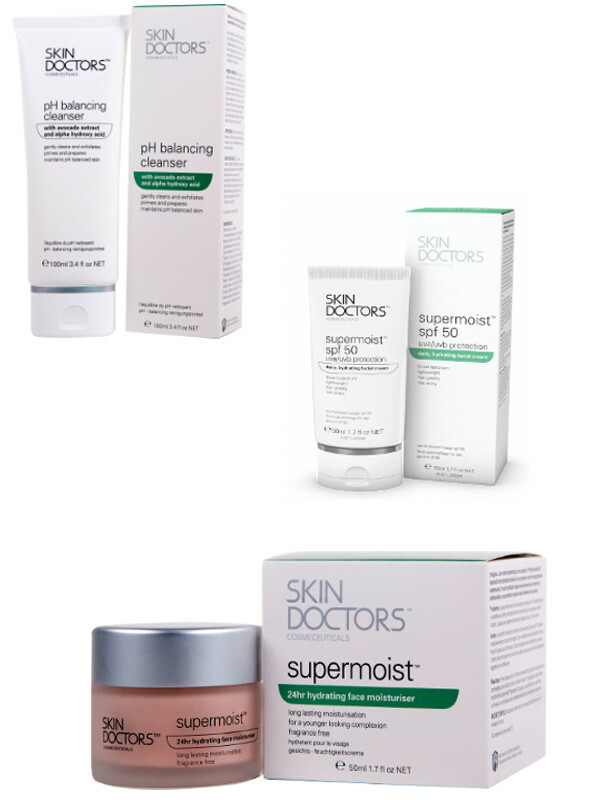 The lightweight, yet moisturising formula of the Skin Doctors Supermoist SPF 50 Moisturiser features Broad Spectrum SPF, and Vitamin E to help protect your skin from the damaging eﬀects of sun induced free radicals. The formula also contains aloe vera extract to provide healing, soothing and moisturising properties for your skin. 50ml RRP $39.95. Rounding out the trio, Skin Doctors Supermoist 24hr Hydrating Face Moisturiser goes to work on your skin overnight, and provides up to 450% more moisture for your skin in just 30 minutes! The intense hydration in the formula works to illuminate your skin and help combat the ageing eﬀects of free radicals, so you awaken with glowing skin. The formula contains Resurrection Plant and Vitamin E to help rectify oxidative changes and damage to your skin caused by UV rays. Fragrance free and oil free. 50ml RRP $44.95. This trio is perfect for holidays or for the time poor, to keep your skin hydrated over Autumn and Winter!